Buffett was able to apply Graham’s principles better than anyone and he is one of the world’s greatest investors. But, he was not the only student of Graham’s to find success. In fact, many analysts to this day have copies of at least one of Graham’s books on their desks. Graham’s first book, Security Analysis, was written with David Dodd in the 1930s. This was in the depth of the Great Depression and the two are credited with establishing the discipline that has become fundamental analysis. Security Analysis advises investors to analyze a company’s financial statements to find bargains. This was a new concept at that time. Prior to the 1930s, little data was available for analysts. Companies disclosed what they chose to and there was no requirement for the disclosure to be complete. In the Great Depression, regulations were adopted that required prompt and complete disclosure of financial information. Against this backdrop, Graham and Dodd’s book was a first. That book was also forward looking. It introduced a number of techniques that are still used by analysts and it introduced the concept of a margin of safety. Less well known is that Graham’s teachings can be distilled into a simple formula. Graham and Dodd wrote a detailed treatise on how to analyze a stock and all of his concepts are important. But, we are going to focus on just two of his ideas that were among his most important. These two ideas can be applied by individual investors to manage their own portfolios. The two ideas we will be explaining are both based on the fact that value matters. Value was largely ignored in the runup to the Great Depression. Investors often traded based on stories or rumors. Graham and Dodd explained that the key to investment success is to avoid overpaying. This requires understanding what a company should be worth. That was the focus of Graham and Dodd’s exhaustive book. But, Graham wrote a second book that was designed for the individual investor. This is the book he would use in his class late in his life and it was called The Intelligent Investor. Because it was designed for individuals, Graham made the process simpler and relied on information that was readily available. First is the importance of earnings. He emphasized the importance of the relatively price to earnings (P/E) ratio and he advised investors to avoid stocks with a P/E ratio that was higher than 15. Second was importance of assets that would provide a margin of safety. Assuming an investor is very wrong, the worst case is that there are no earnings and the company would not survive as a going concern, a term that accountants use to describe a business with operations that generate revenue. In that case, which, remember, is the absolute worst case, the company could enter bankruptcy. This could result in the liquidation of assets to pay off the company’s debt. Graham advised considering the value of the company’s assets to ensure a margin of safety exists. He considered the price to book (P/B) ratio to be an important indicator of value. In theory, this would be the liquidation value of a company. However, the book value of assets often understates the price the asset would realize in a sale. Graham advised investors to never pay more than 1.5 times the company’s book value. Buy only when the P/E ratio is less than 15. Buy only when the P/B ratio is less than 1.5. To create a single formula, we could begin by considering an average of the two numbers. Now, the two numbers, the P/E ratio and the P/B ratio, measure different things. In the case when diverse variables are being averaged, we can use a geometric average. An arithmetic average would add the two value and divide by two since there are two variables. A geometric average of two variables is the square root of the products. In effect, Graham is advising us to buy only when the current market price is less than geometric mean of the maximum P/E and P/B ratios. He set the maximum P/E ratio at 15 and the maximum P/B value at 1.5. In the formula, we would replace P/E with (15 * EPS) and P/B with (1.5 * BV). This would give us the prices where the stock is at the maximum values that Graham recommends. That’s a relatively simple formula and using it, we can now hunt for stocks Ben Graham found value in. 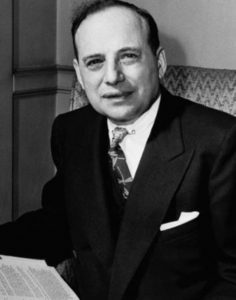 Ben Graham presented these ideas in 1960s and it is almost certain that he was using the strategy before then. Remarkably, it still works. Of course, it’s easier to apply now than it was 60 years ago. Right now, just five large cap stocks pass this screen. That means the stocks have P/E ratios less than 15, P/B ratios below 1.5 and the stock’s current market price is below the value indicated by Graham formula.